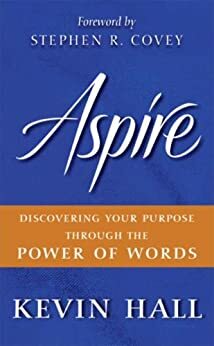 After three days of barefoot water skiing, I settled into a hot bath to nurse my sore muscles and began to read "Aspire." In the Author's Note, Kevin wrote, "The pain is soon forgotten but the memory of the victory lives on forever." He had me right there. 25 years after becoming deaf from barefooting, I had just gotten back on the water earlier this year. The soreness was new to me and I wasn't appreciating it. At that moment, I decided to give thanks for the pain, for it meant that I could enjoy my passion again. I found myself glued to page after page as Kevin unfolded eleven powerful words to include in our life journey of discovering our purpose. Halfway through the book, I hopped out of the tub with my mind swirling with the meanings behind the words that Kevin shared in the book. The first chapter already gave me a message that I wanted to share in an upcoming speech to families with deaf and hard of hearing children. I finished the book later that night and I knew that I had a book that I was going to treasure for a long time. It's rare for me to be moved by a book as much as I was by "Aspire." I have underlined my favorite parts and I know I'll be returning to this book from time to time to be reminded of my life's purpose. This is a book that I'll be giving as a gift to several friends. So if you're looking for that "one" book to read this year, this is the the one. Embrace the eleven words that Kevin shares in his book and you'll surely find your life changing as a result. I read a lot in the personal development genre and I had seen this title surface more than once. The book's website is uber-slick and the video testimonials are very compelling with high production value. All this is to say that Kevin Hall must have some serious money behind his promotional efforts. That being said, the book is well written with each chapter dedicated to one of the words that Kevin Hall feels will help you along your journey toward finding your life's purpose. Most chapters have a sidebar of Kevin Hall's word study with a retired professor which digs into the etymology of each of the words. At the end of each chapter is a little "notes" section of Kevin Hall's reflections. His only "to do" directive is to identify a person who exhibits the qualities of the word in the chapter and approach them. My guess is that by striking up a relationship with such a person, if you already haven't, will only serve to promote and enhance your search for a life's purpose or, maybe, help with the search for a mentor or coach. The book has a lot of the standard self help directives - visualize, find your bliss, and the like. However, it is not as didactic as most personal development literature and it's approach to self help by way of examining certain words is a refreshing approach. It's an easy read and certainly worth the time. When I met Kevin in Colorado near the end of January this year (2012) and heard him speak, I had no idea how my view of the world was about to change. Kevin is a powerful speaker and a person that not only tells a story, but he lives his message. 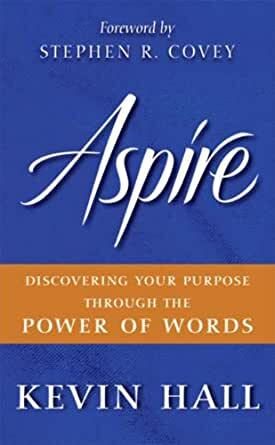 I purchased Aspire and began to read the text and my thoughts and views of the world began to change. A new, very positive view of life began to form and a new level of understanding began to take shape inside me. I continue to pick up my copy of Aspire nearly every night to read again the words and stories that Kevin has written and this book continues to re-shape my view of life. I never put Aspire down without learning something new. This is a rare and beautiful gift and I can not be thankful enough to have had Kevin enter onto my path. After reading Aspire for the first time I decided to pass along Kevin's gift to me, by offering one of the words in the book to each of my 3 children as a gift, on their birthday's this year. My children are 24, 22, and 19 and at each occasion, this gift of a word has moved them and brought my family even closer. My hope is that they too will use this power of words to move others on their paths.